There are so many awesome sites to see in Downtown Las Vegas—a lot of artwork. We’re speaking, of course, about the always interesting, always wonderful DTLV street art. Artists from all over the world have left their mark in our city, big and small. You can still see some of them right now! 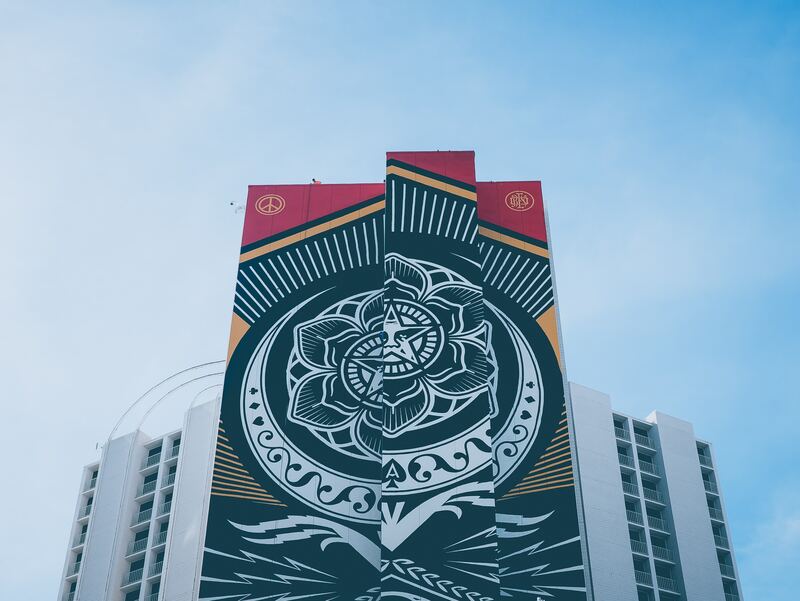 Today, we’ll take a look at the biggest: the Shepard Fairey mural. Shepard Fairey is an icon in the world of contemporary art and design. His work is seen by many across the world. It’s often displayed on clothing, skateboards, or plastered as stickers on stop signs and bus stops. With a face as recognizable as the Obey Giant, Shepard Fairey’s name is hardly eponymous with the image for those outside the world of skateboarding and design. On top of being a sort of punk-chic clothing designer, Shepard Fairey is also a street artist, illustrator, and an activist. He’s contributed to numerous causes in his nearly 20-year career. Besides the iconic Obey Giant, you’ve likely seen some of his other artwork, including the famous Barack Obama “HOPE” poster. Painted on the entire North-West side of the Plaza hotel, those driving in from Utah get a great look at it as they’re coming into town. It’s actually pretty hard to miss. It gives you only a sample of what the Vegas street art culture has to offer. The mural was painted in February of 2017 by Fairey in association with JUSTKIDS and as part of the Life is Beautiful campaign. It is one of the biggest pieces of street art on Earth, stretching an incredible 21 stories.